November 15 is America Recycles Day, so I am popping in late with a link to Time magazine’s feature on the history of recycling, featuring interviews with Susan Strasser, Bartow Elmore, and me. Readers interested in the themes of this article may find expansion on several points in my book Cash for Your Trash: Scrap Recycling in America (Rutgers UP, 2005). This entry was posted in Cash for Your Trash, history, interviews, recycling on November 28, 2016 by Carl Zimring. A few minutes of my Earth Day were spent discussing beverage container recycling (and reuse) for a Marketplace story. This entry was posted in Cash for Your Trash, history, interviews and tagged recycling, waste on April 23, 2015 by Carl Zimring. Personal history frequently dovetails with broader historical trends. That was my experience this week after seeing news about a staple of my childhood. Most kids who grew up in Chicago households with televisions over the past fifty years have probably seen ads for Victory Auto Wreckers. Most scrap and salvage businesses do not advertise on television, but rare was the White Sox game or Saturday afternoon movie of my youth that did not feature at least one Victory ad. Most of the ones I saw are lost to history, but one 1985 Victory Auto Wreckers ad has aired on Chicago television for thirty years. Victory Auto Wreckers is in the news in 2015 because the business has decided to finally update its ad. Although the phone number, address, name, and type of business has remained unchanged, Victory wants to update its image. Owner Kyle Weisner, who took over the business from his father since the last ad was filmed, spoke with Wailin Wong of The Distance (which then provided the story to the Chicago Tribune website) about the image problem. ….change — and an all-new commercial — is finally coming to Victory, which was founded in 1945 by two World War II veterans and is located in Bensenville, Ill., just beyond the southern edge of Chicago’s O’Hare International Airport. A place like Victory, where broken-down cars are stripped and flattened, seems like an unlikely candidate for a makeover. But the business has invested millions of dollars into upgrading its facilities and reshaping its image from a dirty junkyard to a modern recycling center, complete with its own mobile app. What I love about this quote is how explicitly it uses the rhetoric scrap recycling businesses have used to distinguish their businesses from waste and filth for a century. This point is a continuity through the history of scrap recycling, as I noted in my 2005 book Cash for Your Trash. While popular perceptions of recycling in the 21st century link it to environmentally virtuous, ethical behavior, the acts of reclaiming and reprocessing post-consumer and post-industrial materials bore stigma in the early 20th century. Progressive reformers like Jane Addams railed against scrap businesses endangering the physical and moral health of urban children. Zoning ordinances after World War I sought to keep such businesses out of sight and out of mind of most residents. Half a century after the Highway Beautification Act debates, Victory Auto Wreckers continues the rhetorical attempt to define scrap as modern rather than dirty. I look forward to seeing the new ad and wonder whether any kids in 2015 will have any different idea of what goes on inside a salvage facility after watching it. If history is a guide, attempts at an image change will face challenges. This entry was posted in Cash for Your Trash, history and tagged consumption, recycling, waste on April 9, 2015 by Carl Zimring. Nothing prioritizes one’s valued possessions quite like having to move. Faced with packing (and unpacking) dozens of boxes, one may decide that stuff carried around from year to year be jettisoned. Historians run the risk of keeping tons of old papers, be they old conference papers, notes from readings, or copies of primary sources. Since establishing I will move away from the Midwest, the quest to consolidate led thousands of pieces of paper into the recycle bin. But as I sorted papers to pack, discard, or shred this week, I came across a nineteen-page document for the “pack” pile. Twenty years ago, before I made the move back east to study at the University of Chicago, my grandfather Maury visited California for his 83rd birthday. We arranged for me to join him back to his home in Hilo, Hawaii to interview him about growing up the son of immigrant Jews in Black Hawk County, Iowa. 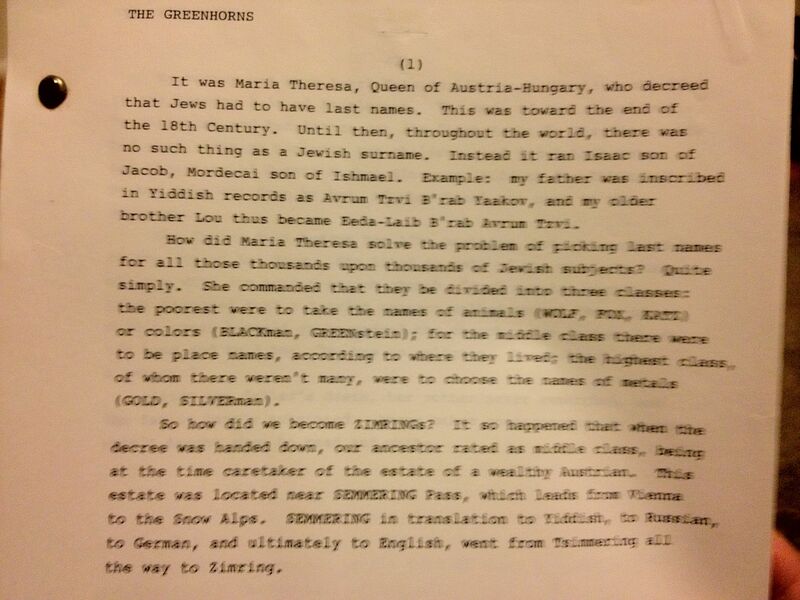 “THE GREENHORNS” (capitals original) focused on my grandfather’s experiences growing up as one of the few Jewish kids in town, but also included the story of how my great-great-grandfather Ben selected the family name, why my great-grandparents Abraham and Pearl fled Europe, and how my great-grandfather wound up in rural Iowa buying junk from area farmers. “THE GREENHORNS” served to structure more than ten hours of discussions he and I taped over a week. Little did I know in 1992 how much this little document would shape my life. Over the next year, “THE GREENHORNS” and resulting interviews inspired my M.A. thesis on Chicago’s importance to Jewish life in the Midwest. (A thesis that owed no small debt to William Cronon’s discussion of Chicago and its hinterlands in Nature’s Metropolis.) But it was not until I moved to Carnegie Mellon University to study urban environmental history with Joel Tarr that it had its greatest influence. Joel and I, it turned out, had family stories in common. Though his family settled in New Jersey and mine was in Iowa, both his father and my great-grandfather worked buying and selling scrap metal. Both were Jewish, as, anecdotally, were most of the men (usually men) who entered that trade in the early twentieth century. 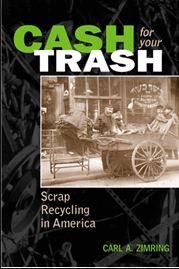 Wondering why that was the case helped inspire my study of scrap recycling practices throughout American history, first as a dissertation, and then as the book Cash for Your Trash: Scrap Recycling in America. While my interest in waste derives from several influences, I see a clear line from “THE GREENHORNS” to my current work. Cash for Your Trash has the most obvious debt, and my grandfather influenced the timing of that book. One reason why I wanted to interview Maury in 1992 was an observation that he was slowing down in his early eighties and I wanted to commemorate his stories while he could still tell them. His memory was a little slow and halting at times, but was still a strong and able storyteller. Two years later, he would fall and sustain brain damage that rendered followup interviews impossible. Even then, he remained a strong-willed and remarkably self-sufficient man. A decade after the accident, however, his body began to give out. My manuscript neared completion in late 2004, and I rushed to finish it so the slow process of turning galleys to a published book could begin. The book came out the following autumn, and my grandfather managed to hold on. Maury died at the age of 96, three days after my father placed a copy of Cash for Your Trash in his hospice room. The book is dedicated to him, in no small part because of the stories he shared in “THE GREENHORNS.” I look forward to unpacking this document when I arrive – not far from the Ellis Island immigrant inspection station where my great-grandfather entered the United States – in New York City. This entry was posted in Cash for Your Trash, history on July 27, 2012 by Carl Zimring.